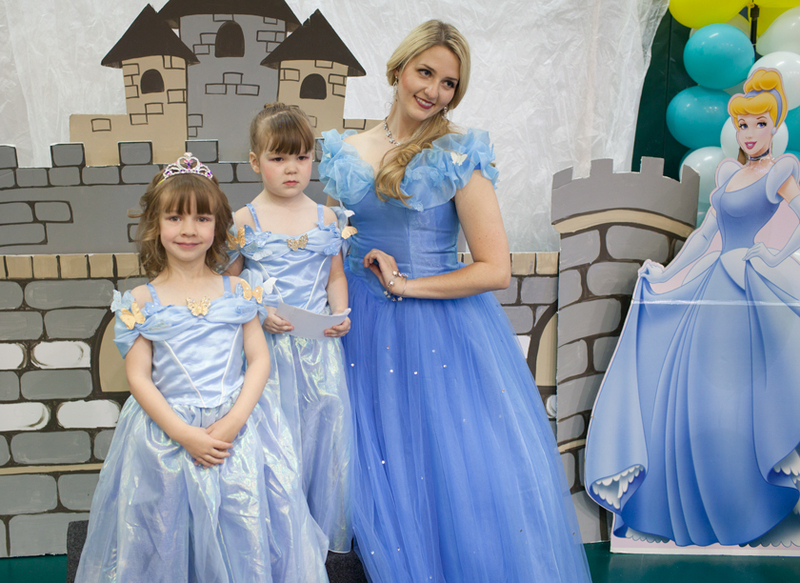 For the past few years Mimi has attended an annual princess party at our local rec center. 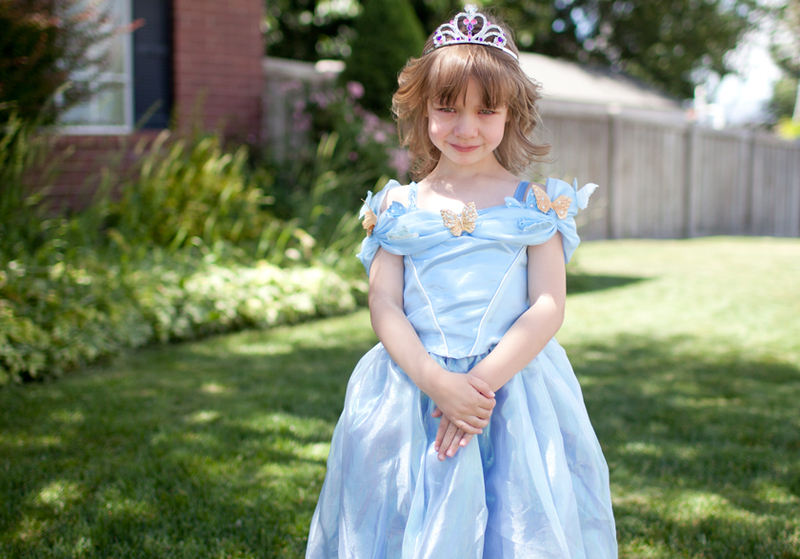 I’m not in love with the mania that is princess culture, but she loves it and we try to balance things out by talking about how being strong, kind, smart, funny, etc… is more important that having fancy clothes. But I still realize that it’s nice to dress up in fancy clothes once in a while. Mimi’s little best friend ES went to the party with her. 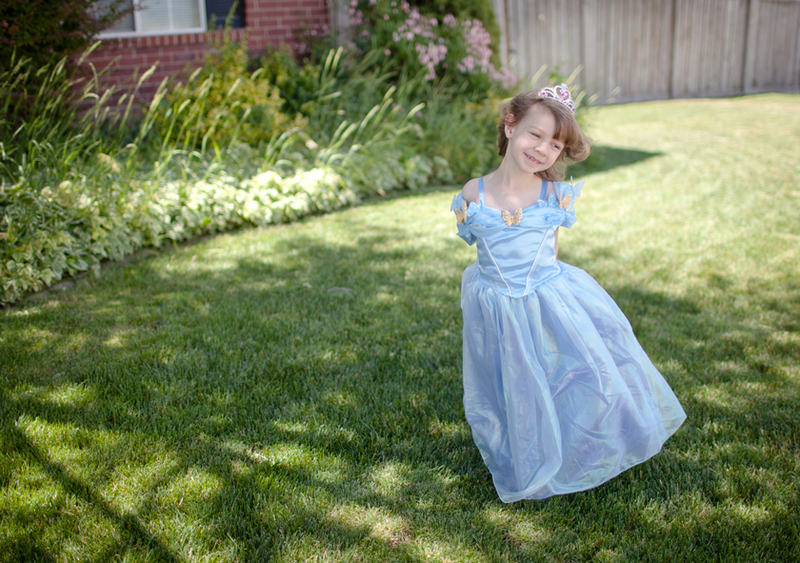 I had found these Cinderella dresses online at the Disney store on super-duper clearance so the girls could be twins. 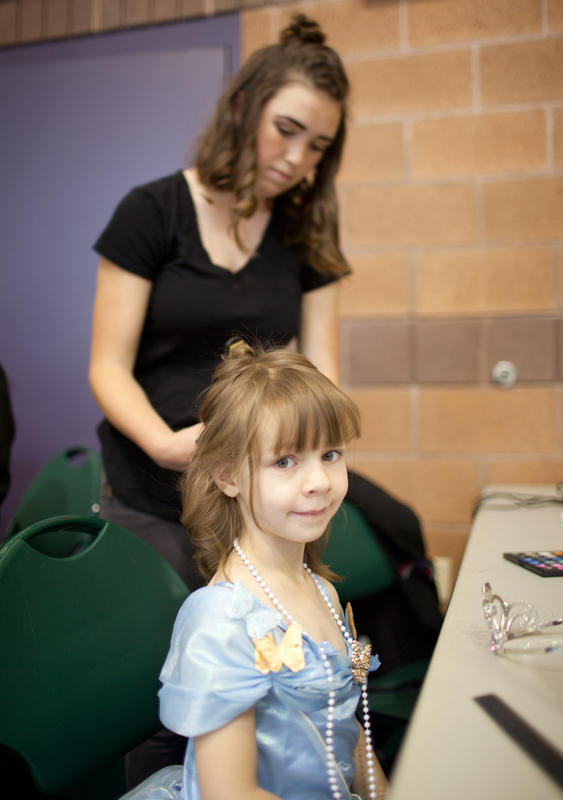 They have beauty school students come do hair and makeup for the attendees. Mimi loved it. The party was very well-run. 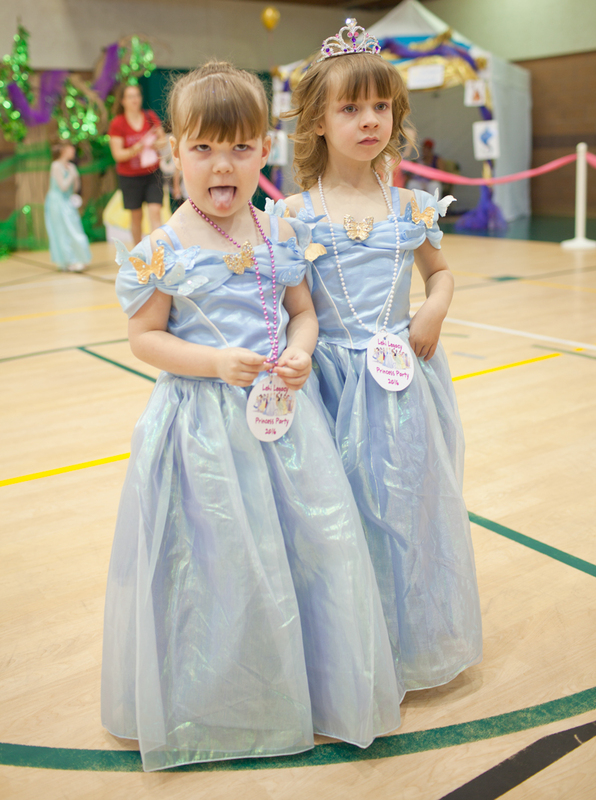 They had stations set up around the gym with different Disney trademark-offending characters at each station handing out different prices (balloons, tiaras, stickers, etc…) and posing for pictures. 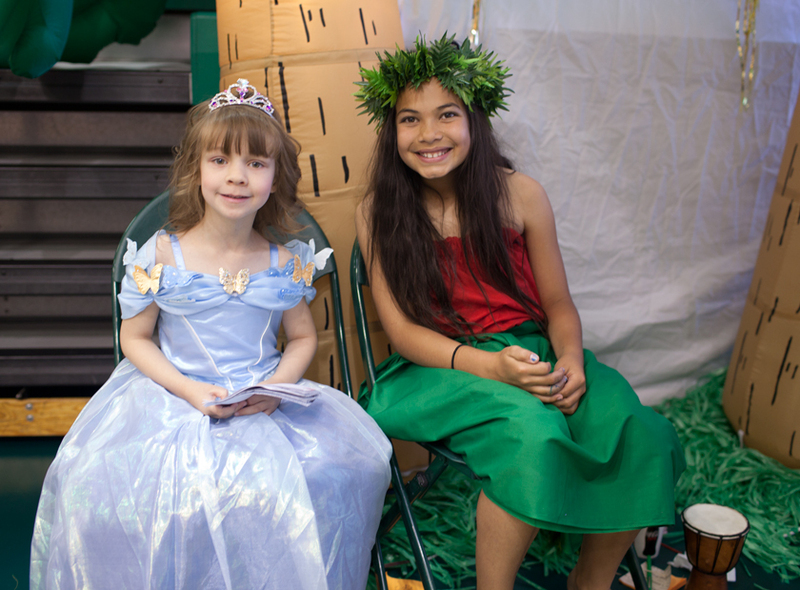 Each attendee also got a little autograph book and Mimi was driven about getting every characters’ autograph. When she finally got every page signed she left out this huge sigh and smiled. She had a great time but by the time we got home we were both done. And then as we got out of the car her balloon escaped and flew away, tragedy! But then Mimi rallied liked the trooper she was. I recently finished this quilt for my friend Stephanie’s soon-to-arrive baby boy, Miles. I used the same tutorial and most of the same fabrics that I used for this quilt but I added some lighter fabrics to break things up a little. I’ve been wanting to try a embroidery for a while so I stitched the baby’s name on the top before I had it quilted by Melissa at So Shabby Quilting who always does a nice job. Last night I started cutting out a quilt for another friend’s baby. It’s for a girl and the fabrics are so sweet. Can’t wait to share it with you when I’m finished! The baby shower for Stephanie was a success (even despite the apparent loss of the last joints of my fingers in a horrible accident). I co-hosted it with a few other friends in my neighborhood and we had a great turn out. My MIL was the unsung hero of the whole thing. She came over the night before and helped me make a bunch of sliced sandwich wraps. They turned out really well and didn’t unravel like others I’ve seen (the secret is gluing them together with a cream cheese mixture!) Sadly I forgot to take any pictures of them but I’ll do a how-to post on them some day. For me traveling with two kids is more than twice as difficult than traveling with one. When we went up to WA it seemed like someone was either hungry or tired every other hour (usually Mimi) or playing too rough and running around like crazy (E). So while there were days on our trip that I crawled thankfully into bed at 9:30 pm, I did go out for a fun night while my mom watched the kids (thanks again, Mom!) It was one of the highlights of my trip. It was an incredible night. I started the evening by going to a Korean spa. I love Korean spas and every time I’m in WA I try and make it a priority to go. I’ve written about the Korean spa experience here, but basically it’s a women-only spa where you relax by soaking in pools of different temperatures. As soon as you enter you take a shower to make sure you’re all clean and then you soak in these deep hot tubs. Everyone’s naked except for little shower caps. After you’ve soaked for a hour or so, you can pay extra and get a body scrub where you lie on a massage table and a middle-aged Korean lady scrubs you all over with abrasive mitts. The dead skin just pills off and is sloshed down the drain. It’s very relaxing and afterward my skin is incredibly soft. I love getting a scrub! When I told my friends in Utah how eager I was to go to the spa and I explained about the body scrubs, I got some blank looks. Some of my friends said they couldn’t imagine being naked in front of others like that. I’ll admit that I still get a little nervous every time I first walk into the spa–there’s that “Aagh! I’m naked!” moment–but I get over it in a millisecond. It’s a very relaxed and supportive atmosphere–I feel less body-conscious there than I would at a beach. After a delicious dinner, Carol generously treated me to a Chinese foot massage which was incredible! They massaged our feet, but also our shoulders, backs, legs, and arms. When it was over I felt like a limp noodle: a limp noodle with a full tummy and super smooth skin. I wish we had foot massage places like that here in Utah! Going to the spa, catching up with a good friend over Korean BBQ, and getting a foot massage–a month later that evening still shimmers in my mind like a dream. I’ve always been more of an indoors type of person, much more prone to reading novels and watching movies than being outside in the heat bopping around and sweating. But lately I’ve been thinking that my body could benefit from more bopping around and so when my friend and neighbor Jen asked me if I wanted to take a few golf lessons with her I jumped at the chance. I like learning new things and hanging out with a friend sans kiddos is always nice. Tonight was our second out of four lessons and I have to say that I’ve gained a lot of respect for anyone who’s halfway decent at golf. It is hard! I never imagined how difficult it could be to swing your arms a particular way. And we haven’t even tried chipping or putting yet (aye, yai, yai). Lately I’ve been enjoying reading about the adventures of our former babysitter Jenna. Right now she’s on a study abroad trip to Chaing Mai and reading about her adventures is bringing back some memories of my own college trip to Korea (various aspects of which have been immortalized in song). When I was in Korea I remember feeling like my very consciousnesses was expanding; it was the first time I really felt how big the world was. And even though it was *gulp* a long time ago, that trip still influences the way I look the world. 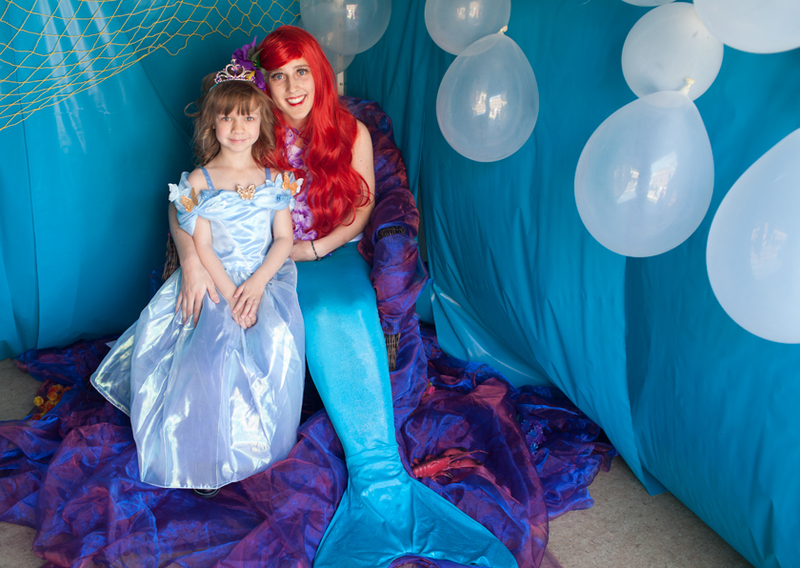 It’s exciting to read about Jenna having her own life-changing experiences. I have a lot of respect for her because while I grew up with a Korean mother (and Korean food and culture) and had taken a year of Korean classes in college before my trip to Korea, Jenna doesn’t speak any Thai and hadn’t even really eaten Thai food before she left. Talk about culture shock! If you’re interested, follow her blog, Time for Thailand. She’s a good writer and keeping a blog is part of her coursework so she’ll be updating it regularly. We had a fun time at my brother-in-law Ken’s book signing last night. Since he moved to Seattle after winning all that money on Jeopardy we don’t often get the chance to see him speak so it was neat. Thanks to our friends who came, especially Stephanie and Nick who graciously entertained my kids for a while. E and Mimi were up way past their bedtimes and E’s tiredness manifested itself in a spectacularly manic manner so the extra hands were much appreciated. This week has flown by. My friend and neighbor (and Kristin Bell doppelganger) Stephanie had some time off from work this week so we got to hang out together during the day which was a rare treat. Besides being a lot of fun to be around and being adored by my children, Stephanie has more can-do energy in her little finger than most people have in their entire body. After spending time with her for a few days magically my kitchen cabinets are covered in several more coats of paint, all the junk in my car has been cleaned out, AND I am back in possession of the little diamond band that N gave me for our 10th anniversary last year! I lost the ring last October and as the months went by without it turning up I became resigned to it being gone. But it turns out that all this time it had been tucked under some junk in my car (of which, admittedly, there was a lot). When Stephanie pulled it out of the car and showed it to me we had a full on Oprah-“everyone-gets-a-car!”-type hugging and shrieking fit. I was ELATED. So elated in fact that I’m not bummed about losing my drivers license any more. Yes, that’s right–the reason we were cleaning out my car was that I had put my drivers license in my pocket when we were running errands and (predictably) lost it. (I know, I know–it’s okay, you can groan out loud, goodness knows I have.) Apparently pockets and I have a deep-seated antipathy. But let’s not focus on that; I have my ring back! After all, this time I’ve totally learned my lesson.